Since mid-June the oil price is up 15%, which has breathed fresh hope into beleaguered energy companies globally. The catalyst for the recovery in the oil price was the announcement that Saudi Arabia, OPEC’s largest producer, will limit oil exports coinicidentally as the Saudi's begin to start marketing what is likely to be the biggest IPO in history. We see this as behaviour designed to boost the profit margins temporarily, similar to what is done by many vendors prior to any IPO. In early 2018 the Saudi’s are looking to conduct an initial public offering (IPO) of around 5% of energy giant Saudi Aramco for a predicted price of US$100 billion. In this week’s piece, we are going to look at how to analyse IPOs and specifically this one, which is likely to be the biggest IPO since the Amsterdam Stock Exchange was established in 1602 to allow trading in the Dutch East India Company equities. 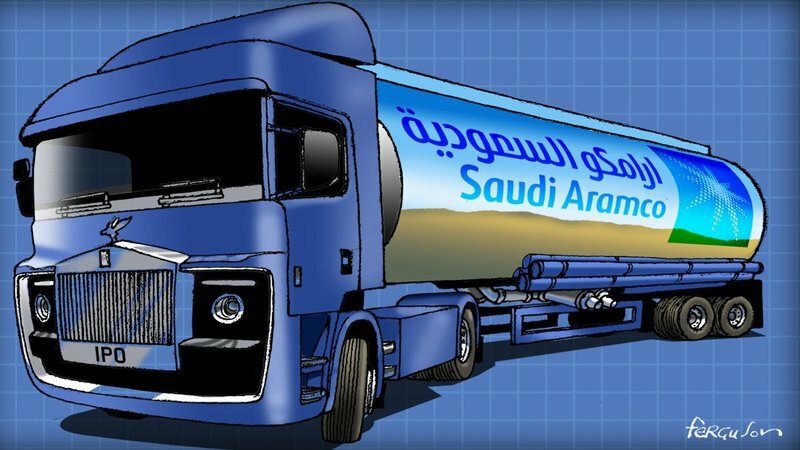 Last January the Saudi Arabian Crown Prince Mohammad bin Salman Al Saud announced that the Saudi government intends to offer shares representing about 5% of Saudi Aramco, its national oil company. Aramco has been under government control since the Saudi Arabian Oil Company was nationalised nationalized in the 1974 following US support for Israel in the Yom Kippur War. Aramco is the largest global oil producer and therefore this IPO marks a shift in thinking in the Kingdom as the proceeds are being used to help diversify the economy away from oil. The IPO is planned to be listed on exchanges in Riyadh, with a secondary listing in London, New York, Hong Kong or Singapore. The expected value of 5% being floated in 2018 is touted as around US$100 billion which would value the entire company around US$2 trillion. This is significantly larger than Apple (US$742 billion), Google (US$653 billion) or Exxon Mobil ($342 billion). Under these circumstances the Saudi’s have a very strong incentive to move the oil price higher over the next 9 months! The motivation behind the IPO is one of the first things we consider. Historically investors tend to do well where the IPO is a spin-off from a large company exiting a line of business. An example of this is Orica and their paints division Dulux. New investors also tend to do well when the vendors are using the proceeds to expand their business. The probability of new investors doing well from an IPO is far lower when the seller is just looking to maximise their exit price. A classic example of this is the Myer IPO. In the case of Aramco, the IPO is designed to help makes changes to the Saudi economy and increase investments in non-oil assets. Cynically it could be viewed that the vendor is concerned about the longer-term demand for oil with increasing amounts of Teslas roaming the streets, though only 5% is being floated off at this stage. Is the business easily understood? Given the reduced level of historical financial data it is important that an investor can easily understand how the company makes money and maintains competitive advantage. When Shopping Centres Australasia was listed in November 2012, it was clear how the company made money from collecting rents on Woolworths' shopping centres. Similarly, in the case of the best float of 2015 (+127% since listing) it was easy to understand the Costa Group’s business model of growing mushrooms, berries, citrus and tomatoes with the logistics operations to deliver these to consumers. Whilst the Aramco business of extracting oil easy to understand, like most IPOs the financial data may be limited. The secretive company has never needed to disclose any kind of financial statements and details about the company’s most important asset, its oil reserves are state secrets. Any IPO is presented to the market in the most favourable light (albeit with a large number of disclaimers), and at a time of the seller's choosing. Over the last six months we have seen a number of businesses being listed that have been unprofitable for a number of years, yet are expected to switch into profitability in the years immediately after the IPO. We put little store in the notion that companies are being listed for the altruistic benefit of new investors. Thus, investors should be sceptical of predictions of dramatic improvements after listing, especially when the IPO vendors have significant incentives to show profits before listing! Saudi Aramco is likely to be very profitable with international energy consultant estimating costs of production around US$9 per barrel. The cost of production is so cheap as the oil in Saudi is primarily located near the surface of the desert and pooled in vast fields, so unlike Australia it doesn't need to invest very expensive offshore oil platforms taping into reserves often 100kms off the coast. The question for minority investors is the extent to which this enormous company will be run in the interests of the minority investors committing $100 billion or whether profits may be diverted to the state. Two months ago, the Crown Prince said that decisions about oil and gas production and investment will remain in the hands of the Saudi government after the IPO. In March 2017 in what looks like a move to improve the books prior to the IPO, the Saudi government reduced the tax rate levied on Aramco from 85% to 50%. Investors in this IPO would probably be concerned that this tax rate could change post-IPO to fund government budget deficits given that Aramco currently accounts for 80% of the Kingdom’s budget revenue. The sole reason behind any new investment is the view that it will generate a higher rate of return than alternative options in an investor’s portfolio. It is too early to make any pronouncements as the financials have not been released, but any investment would want to take a conservative long-term oil price into account and discount stronger oil prices that we may see over the next nine months. Despite what is contained in the marketing documents for every IPO, in determining a valuation potential investor should apply a discount to currently listed companies. Due to an IPO lacking a listed track record and investors having less financial data; a discount to currently-listed comparable companies should be applied when valuing an IPO. In the case of Aramco, in our opinion the price investors should pay would be a 20% discount or greater to valuations at which companies such as Exxon Mobil, Chevron or Shell are trading at. Whilst new IPOs are presented as fresh, exciting ways for investors to make money and access different high growth companies or assets, we see that the best approach to evaluating IPOs is to start from the default position that the vendors are trying to cheat you and then work backwards from there. The best IPOs I have seen over the past 20 years have been one’s where the vendor is under-pricing the asset being sold, leaving some upside or “margin of safety” for the new investors. Understandably this is a very rare occurrence for profit-maximising private equity owners and possibly Middle Eastern Kingdoms. The Saudi government (just like private equity vendors) may face some domestic backlash for pricing the IPO too low if Aramco performs strongly post listing!